Be a successful boudoir photographer! Get tips and hands on experience (as well as photos for your portfolio). What do you get for R3000? I will be handling various topics and I tailor make the session to what you need to know (based on a questionnaire you complete ahead of time). You will get access to two gorgeous models (depending on the number of photographers) for the WHOLE day and you will be involved in the outfit choices for each model as well as what make up and hair would suite each model. There will be a qualified make up artist available during the entire workshop. Emphasis will be given on how to pose a fuller figure model. Delicious lunch will be served as well as snacks. 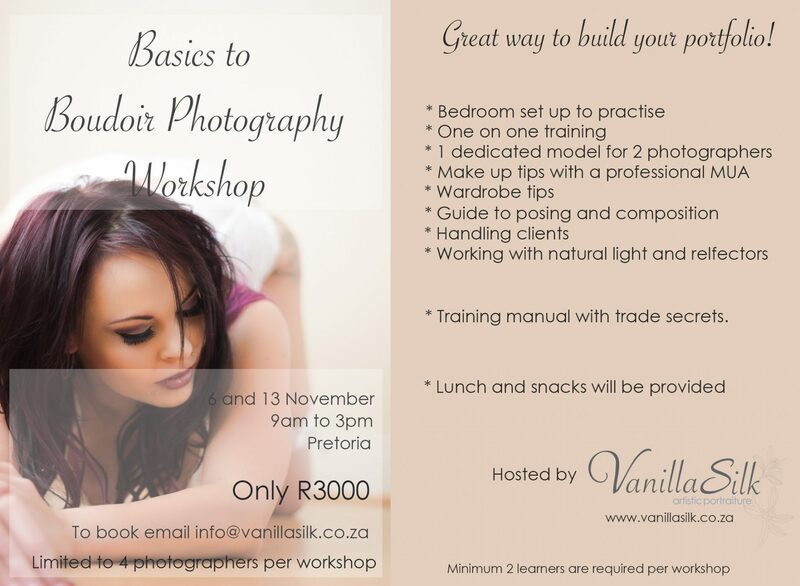 I guarantee you will be able to walk away with all the knowledge of the basics of boudoir.